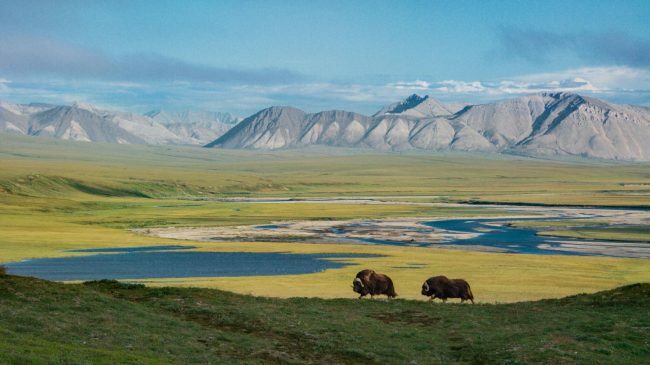 The Department of Interior continues its race permit oil and gas leasing on the 1.6 million acre coastal plain of the Arctic National Wildlife Refuge. While 800,000 “nonessential” Federal employees were idled by the recent government shutdown, the Bureau of Land Management continued work to complete the Draft Environmental Statement (DEIS). However the news isn’t all bad as public comment deadline on the DEIS has been extended from February 11th to March 13th. As part of the public comment period, BLM has launched a rushed round of public meetings. The format of these “open house” meetings (as reported by Alaska Public Media here) includes a slide presentation from the agency and opportunities for the attendees to provide testimony via computers and court reporters, DOES NOT include opportunities a forum for the public to speak out. Meetings have already occurred in Fairbanks, Kaktovik, Utqiagvik, and Fort Yukon. Meetings are scheduled at Arctic Village (Saturday, Feb. 9), Venetie (Sunday, Feb 10), Anchorage (Monday, February 11), and in Washington DC (Wednesday, Feb 23). Your attendance and participation in these meetings is important and valuable – in spite of the shortcomings of the meetings’ format and opportunities for public engagement. More information about these meetings is available here. If you are unable to attend, you can submit comments on proposed Arctic Refuge leasing alternatives presented by the BLM before March 13th at blm.gov/alaska, or by mail to Coastal Plain Oil and Gas Leasing Program EIS, 222 W. Seventh Ave., Stop #13, Anchorage, Alaska 99513. Your assessment of the value of the Refuge, including its importance as one of America’s last wild places. The Administration’s failed promise to Americans that the permitting would include a robust, scientifically sound review process with public comment and full tribal consultation. The BLM’s disregard for the serious biological, cultural, and climate impacts fossil fuel extraction will have in the rapidly-warming Arctic. Your specific concerns regarding species, ecosystem functions, the potential contributions of greenhouse gases to global climate change, etc. The Bureau of Land Management’s website includes additional information on the leasing program, including the EIS.